Over 60 members of public attended Seaford’s recent Annual Town Forum to receive an update on Town Council activities over the past year, watch as the deserving recipients received their Mayor’s and Young Mayor’s Awards and heard presentations from local community groups and charities. The 2018 Town Forum, hosted by Seaford Town Council and opened by Town Crier, Peter White took place at The View at Seaford Head on Tuesday 22nd May and was a very positive meeting, full of key updates and information, and inspiring messages from the award winners and community groups in attendance. 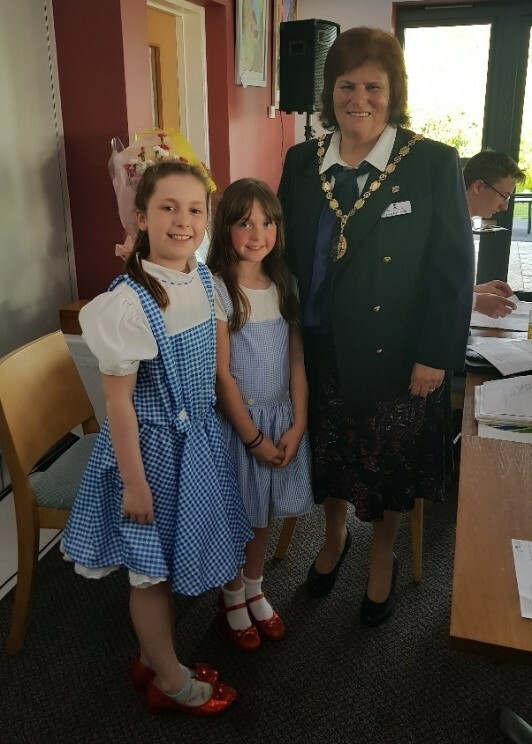 The recently re-elected Mayor of Seaford, Councillor Linda Wallraven, welcomed all those in attendance to the event and started the proceedings. Presentations were made by Citizens Advice Bureau, CTLA, Waves Seaford, Seaford Lifeguards, Seaford Community Events Committee (Motorfest) and Seaford Musical Theatre, who had all received large financial grants from the Council during 2017. The presentations ranged from verbal updates and a YouTube video of Seaford’s Motorfest event (can be found at www.youtube.com/watch?v=Ew_j8uuQ0yc), to a live performance from two young members of Seaford Musical Theatre Juniors charming the audience with their lovely rendition from The Wizard of Oz, which the theatre is staging during June. All the presentations were informative sessions and helped raise understanding and awareness of how these vital grants can really change people’s lives and improve the town of Seaford. Also present were those groups and charities in receipt of small financial grants (under £500) during 2017, who had taken the time to arrange display stands letting people know more about what they do and with literature to give out. Again, the Council thanks those organisations; Epilepsy Sussex, Kent, Surrey and Sussex Air Ambulance Fund, East Blatchington Pond Conservation Society, Seaford Hard of Hearing Club and Teddy Treats. Seaford Youth Forum and Neighbourhood First also came along and had a stand to talk about what they offer in the town. Attendees were also able to hear about the Strategic Objectives adopted by Seaford Town Council in April 2016 and how the Council is working towards achieving these, including sustaining and improving the economic wellbeing of the town, its environment and recreational facilities, meeting the needs of the community and practising good governance. During the event, presentations were also made to the Mayor’s chosen charity of the funds raised throughout the past year. Councillor Wallraven was thrilled to be able to present Seaford Lifeguards with their cheque of £4,011.72. Seaford Lifeguards are entirely voluntary and have been recognised as one of the best lifeguard services in the country; Seaford is blessed to have such a remarkable group of people ensuring the safety of its beach and users. The evening then moved on to the annual Mayor’s Awards; Mayor, Councillor Linda Wallraven, was pleased to be able to announce her awards to individuals that have helped support and enrich the town; Ken & Julie Jupp (Royal British Legion), Maeve Mabey, Hilary Norsworthy, Brenda Edwards (Teddy Treats), Mike Roper (The Rotary Club) and Thomas Exley (2017/18 Young Mayor). 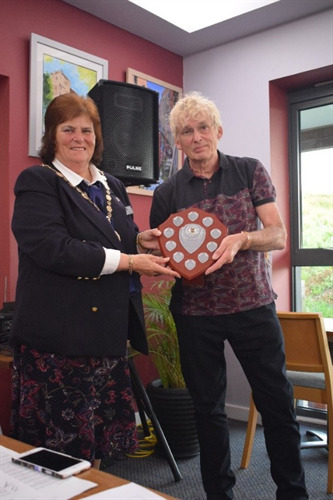 The Annual Don Mabey award, awarded to individuals for outstanding service to the town, was presented to Geoff Stonebanks for his continuous fundraising. Having been fundraising for over 10 years, largely through organising open gardens, Geoff has raised in excess of £100k for Macmillan Cancer Support and the various Mayoral charities, a truly admirable achievement and one that he continues to increase each year. Congratulations to Geoff for his hard work and passion for raising well needed funds! The 2018 Mayor’s Open Garden Trail, organised by Geoff Stonebanks, takes place on Sunday 10th June; find all the details on http://www.geoffstonebanks.co.uk/mayor.html . Please do go along and support Geoff’s fundraising, whilst taking in the beauty and uniqueness of the nine open gardens. The 2017/18 Young Mayor, Thomas Exley, summarised on his two years with the Council and the success of his campaign to raise funds to install a wheelchair accessible swing in The Salts. With the help and support of everyone involved and all those who donated, Thomas was thrilled to announce that he had reached his target of £10k and is working with the Town Council to hopefully have the swing installed in early-Summer. Thomas chose to present two Young Mayor’s Awards, which were sponsored by Seaford Rotary Club; the first to Martin Murdoch and Janet Daynes of the Blatchington Miniature Railway and an Award of Courage to Brandon Whitham, a student at school with Thomas. Dominic Avey, 2018/19 Young Mayor, informed the meeting that is his year of office he would be aiming to raise funds for the art, drama and music department of Seaford Head School. Dominic also introduced the new Deputy Young Mayor, James Jenkins, who unfortunately was not able to attend. The minutes and photos of the event will be available on the Town Council’s website at www.seafordtowncouncil.gov.uk or updates can always be found on the Council’s Facebook and Twitter pages, search Seaford Town Council and link to it for the latest news. The Town Council wishes to thank all those that attended the event, gave presentations and took part, and offer its congratulations to those well-deserved award winners!